Washington, DC (February 22, 2019).—Mr. 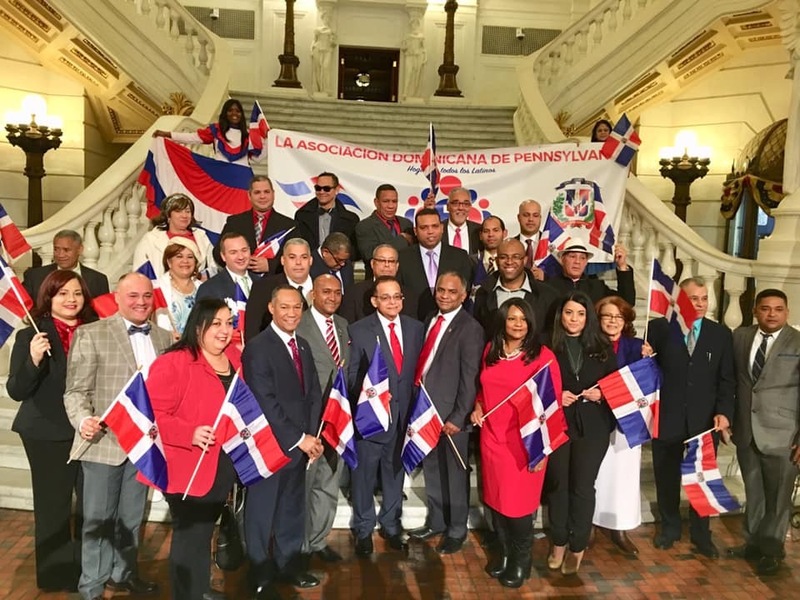 Delfin Vasquez, President of the Dominican Association of Pennsylvania, and Vice President of the National Dominican American Council (NDAC), spearheaded a historic commemorative event to celebrate the 175th Anniversary of the Independence of the Dominican Republic. Upon his invitation, a delegation of leaders from across the State of Pennsylvania joined in comradery on Tuesday, February 19, 2019 at 11 am at the Pennsylvania Capitol in Harrisburg. Mr. Danilo Burgos, the first Dominican American elected to public office in the history of Pennsylvania as PA State Representative, co-hosted the event and an opening reception in the East Wing of the PA Capitol to welcome the delegation. State Representative Burgos delivered the keynote address in the PA Capitol Rotunda. He conveyed sincere greetings and paid respect to those leaders who sacrificed their lives to found the Dominican Republic in 1844. The list of leaders who attended the celebration included Allentown councilmembers Julio Guridy and Cynthia Mota, Fermin Diaz, Cesar Franklin Liriano, Gabrielina Lopez, Isa Pereyra, Nicarol Soto, Dolores Minaya, Johanny Cepeda-Freytiz, Pedro Rodriguez, Gino Hernandez and Manuel Marte from the National Dominican American Council, Patricia Vasquez, who represents the Dominican American Roundtable in PA, and several other individuals from across the state. El Concilio Nacional Dominico-Americano (NDAC) es un órgano de apoderamiento y participación cívica fungiendo en los Estados Unidos en trabajo mancomunado con entidades progresistas such as the Dominican American National Roundtable (DANR) and the Latino Leadership Alliance (LLANJ). NDAC, dirigido por una junta nacional de directores presidida por un Presidente/Chairman, está compuesto por concilios locales y regionales establecidos con la función de abogar por el avance socioeconómico y político de los dominicanos en los Estados Unidos y sus territorios, incluyendo Puerto Rico y las Islas Vírgenes Americanas. The National Dominican American Council (NDAC) is a civic-community-engagement and public relations entity composed of local member councils in the United States and territories, including Puerto Rico and the Virgin Islands, with the role of setting the national agenda and working jointly with the Dominican American National Roundtable (DANR), the Latino Leadership Alliance (LLANJ) and progressive entities advocating for the socio-economic and political enfranchisement of all Latinos and Dominican-Americans in areas concerning education, economic development, health, immigration and community empowerment.